Canada Lands Company Limited is an arms length, self-financing crown corporation reporting to the Canadian Parliament. We were approached to develop a custom website using the Drupal Content Management System. Canada Lands Corporation Limited (CLCL for short) appraoched us with a problem : They had a very old Drupal 6 website that was completely out of date. There were sporadic problems with their existing web hosting provider that caused frequent outages, causing communications and visibility problems. 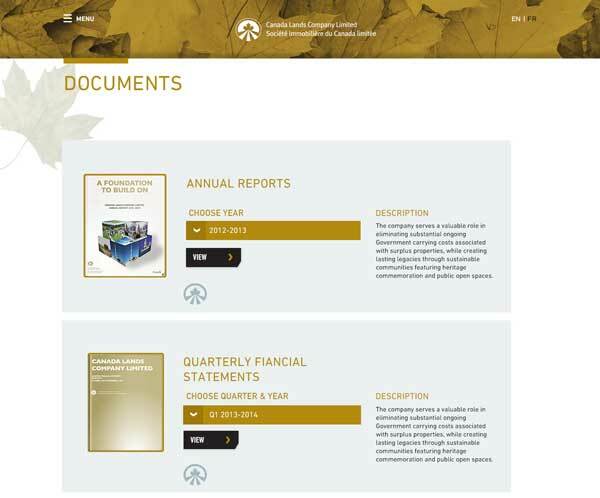 Since the CLCL website largely serves as an important communications and reporting tool, which was also mandated as a requirement from the Canadian Parliament, it was quickly prioritized to migrate their content to a fresh new theme on the latest version of Drupal (8). The design was a fresh transition from an old outdated layout to a clean, concise and fresh design. The client was pleased with the outcome as well as the problem free transition. Drupal 8 is. in many ways, a completely different content management system from its predecessors. Since many features were re-written from the ground up, direct compatibility from older versions of Drupal (especially 6) required extensive research and testing to ensure compatability and content migration would be successful every step of the way. A detailed audit of the underlying modules, custom code, custom content and everything in between was first performed. The first thing that was migrated was the configuration and settings within D6. This includes site settings, SEO keywords, permissions, users and many other elements of the core Drupal installation. Next we moved to migrating the content. This would include nodes, taxonomy terms, entities and views were migrated to Drupal 8. Many passes were needed in order to ensure the transition of all the elements was smooth and there weren’t any unforeseen problems.